Such great ideas! I would have to say my biggest timesaver at work is Evernote. I have it on my laptop at home and at school and it is synced to my iPhone and my iPad. It’s my giant digital file cabinet. I keep present levels and evaluation reports in a “notebook”. Evernote is organized by notebooks and notes. For getting to work, I have lunches ready (I’d say in 4 out of 5 opportunities as measured by therapist data…haha) and I have my outfits for the week lined up in the closet. My biggest tip is to find a little bit of time just for you everyday, even if it’s in the small hours of the morning before everyone else is awake. I try to stick to that because it really keeps me grounded and positive. I hope you can use some of these tips to make your days run more smoothly. I know I will. 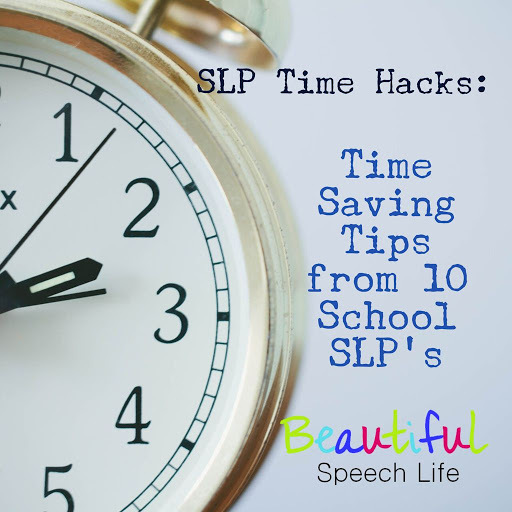 Be sure to click on the blog names to be taken straight to more SLP blogger tips and insight. Such a great community! Did you like this post? If you did sign up for my email list to be the first to know about new products, freebies and sales. Also follow me on TpT to receive exclusive monthly freebies only available to TPT followers. This month I am focusing on time, how to become friends with it, how to enjoy it and how to use it to keep my life on track with my dreams. As a school SLP (I’m sure all you teachers relate too), I feel like I’m always juggling and bartering with the universe for more time in pretty much all areas. Time to work out, time to eat healthy, time for paperwork, time for therapy, time for planning, time for family, time for friends and oh yeah some time for me. Working in the schools, we don’t have time to go out for lunch. Most of us use our 30 minutes to scarf something down while we write a report or catch up on Facebook. This year I’m trying to be more mindful of my food consumption. To put healthy food in my body and to enjoy, even savor eating it. I know that’s a tall order. I’m not an expert on the subject by any means but here are some weekly habits that help me stay energized and healthy. 1. Cook enough protein the night before to have a serving with your lunch. I don’t like leftovers, don’t even like the word. But I do like cooking an extra chicken breast that I can slice and put on a yummy salad. 2. Meal prep on the weekend. Set aside a couple of hours on Saturday or Sunday to chop vegetables, cook meat, bake sweet potatoes, make soup, make egg bites, or salad in mason jars. If you’re feeling very Pinterest check out my Pinterest Board: Healthy School Lunches for Me. 3. Buy pre-made salads at the grocery store. Trader Joe’s, Sprouts, Whole foods and even Safeway all have great little individual salads. Sometimes I buy the salad kits and leave one in the fridge at work, they last me for three days and I’ll just add protein. 4. Keep an emergency stash of protein bars. It’s really important to get enough protein to balance with your carbs and avoid the blood-sugar-dropping mid-afternoon slump. At least then on those rush days you can grab an apple and have your chocolate chip cookie dough quest bar, (my personal favorite). 6. Mix it up. Try not to get in a food rut and eat the same thing every day. I avoid bread but every once in a while I bring a sandwich made from Ezekial bread or a wrap. That way I don’t get bored and decide I need to eat something from the cafeteria. 7. Take a few uninterrupted minutes to enjoy your food. Did you know you can be eating the most nutritious food in the world but if you are not enjoying it your body may not metabolize it to the fullest? 8. Eat with someone you like, even if that is yourself. Eating with negative people can’t be good for you and it’s certainly an energy drain when you’re busy trying to replenish. 9. Get up and move! Walk around the school, stretch, get some fresh air. Our job requires a lot of desk work, take a few minutes at lunch to breathe and get some movement. You’ll be glad you did. 10. Water. Period. Make sure you hydrate. So important. Lack of water is the number one trigger of daytime fatigue. A 2% drop in body water can trigger fuzzy short-term memory, trouble with basic math and difficulty focusing on the computer screen. Can’t have that while we’re doing our Medicaid billing now can we? I hope you can use some of these ideas to help your weekdays go more smoothly. 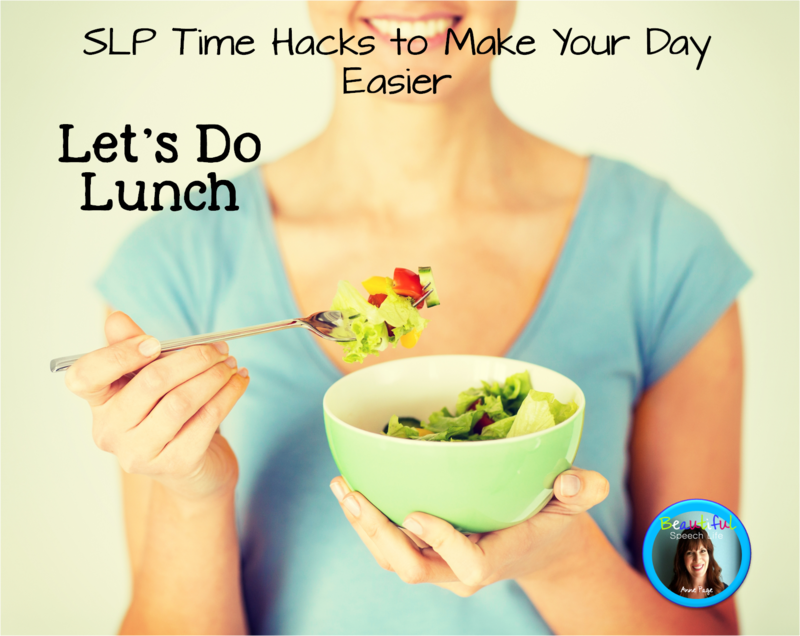 By planning ahead and preparing yourself a yummy lunch, you’ll have something to look forward to and give yourself enough energy to make it through the day. And maybe even have some time for yourself at the end of the day.